This post is sponsored by Bob’s Red Mill, who’s inspired the inner baked goods buff in me this week. 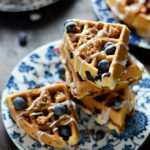 Suddenly, I’ve found myself fantasizing about muffins and waffles and the intersection of them both. And tenting my fingers maniacally as I brainstorm recipes that straddle the line between breakfast and dessert. 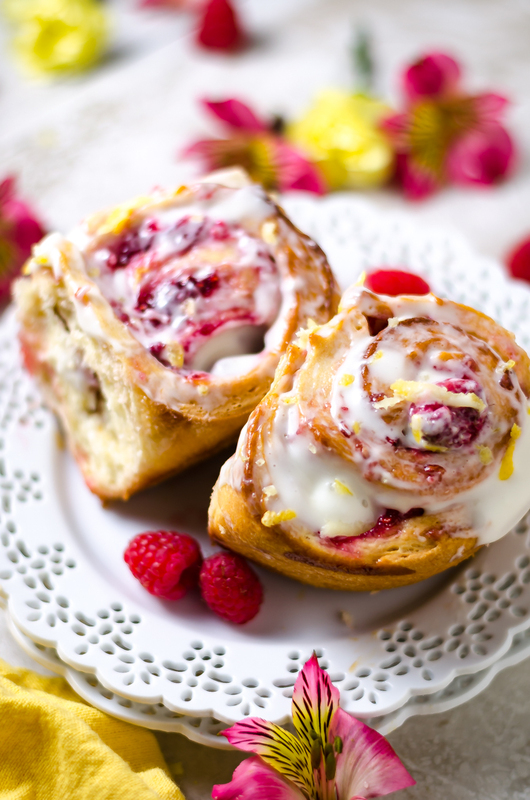 Part cinnamon roll, part danish; these sweet rolls bring soft, fluffy and flaky dough bursting with bright berry and citrus to the breakfast table. 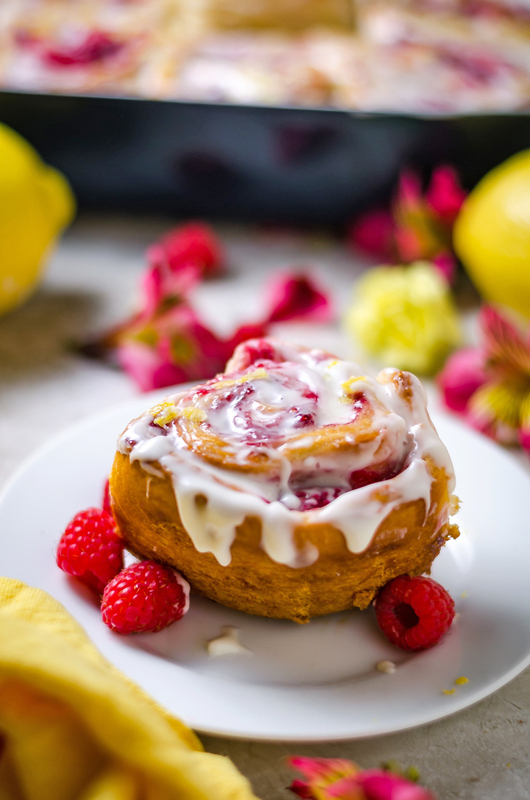 Bob’s Red Mill Organic Unbleached White Flour works amazingly for these sweet rolls because it’s a high protein flour that produces well-textured yet airy baked goods– and it’s often used by professional bakers for good reason. I use it to make the dough a sort of hybrid between danish pastry dough and cinnamon roll dough– tender, buttery, and flaky, but still with the fluff and crumb you’d expect from a cinnamon roll. 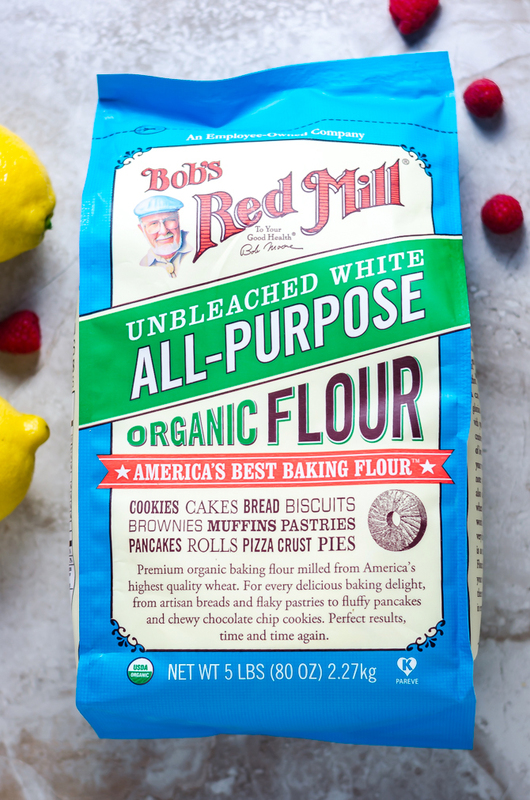 You can also use Bob’s Red Mill Gluten Free 1-to-1 Baking Flour or Paleo Baking Flour if those are a better fit for you. They’ll work just the same. Now, if the idea of making your own dough worries you, take a few deep breaths and trust me when I say this dough comes together incredibly easily. 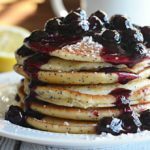 You can make it in a food processor (which is my favorite method), or a stand mixer, or you can mix it all by hand. Then you simply assemble your rolls and let them rise in the fridge overnight. No precise rising timing to stress over, no fussing for hours in the morning to assemble breakfast: just let the rolls sit at room temperature for a bit, pop them in the oven, make the glaze, and enjoy. Go on and just try to tell me that that doesn’t sound like the perfect holiday brunch solution. 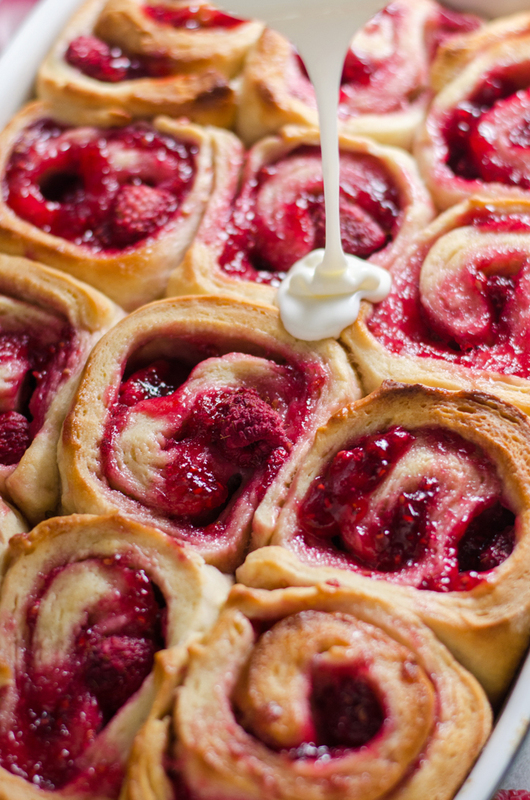 The dough isn’t the only exciting and easy aspect of these sweet rolls, either — we’ve hardly touched on the raspberry filling yet. Guys, I’m almost embarrassed to admit how easy this filling is to make. All I do is combine some raspberry preserves with fresh raspberries and haphazardly spread it around the buttered dough. (Oh yes, I still butter the heck out of it first). 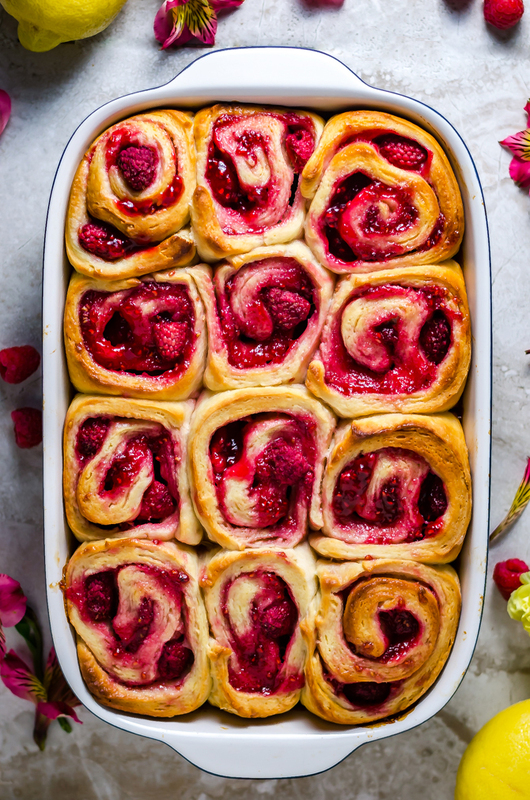 It’s got that jelly doughnut-esque thing going for it that makes these Raspberry Sweet Rolls extra lovely. What’s a sweet roll without a slathering of sweet glaze all over? 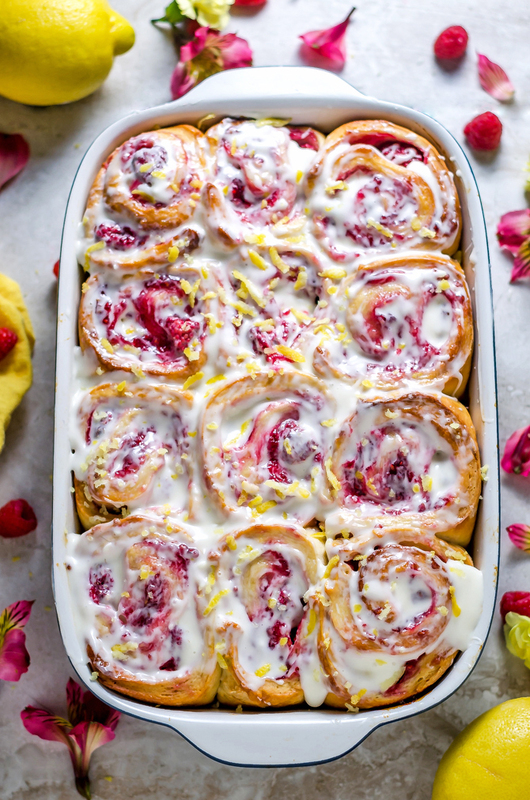 Some people like to lightly drizzle theirs, but because the filling of these are not as sweet as it’d be with a cinnamon-sugar roll, I prefer to absolutely blanket my Raspberry Sweet Rolls in the Lemon Cream Cheese Glaze. 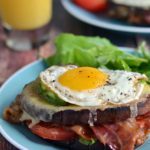 Go big or go breakfast-less. You can make the glaze while the sweet rolls are cooling– it only takes minutes to mix together. Just try not to give yourself too much time or you might find yourself “taste-testing” a little bit too much of it. You want to save plenty for those rolls, remember. The Lemon Cream Cheese Glaze really is the icing on the cake here, by the way. The tangy citrus and cream cheese amplify the tartness of the raspberries while providing balance to all of the (much-enjoyed) sugar. I sprinkle the glazed rolls with some lemon zest right before serving, and then dig in while they’re still warm and gooey on the inside. That’s right, serve them warm and fresh from the oven to your friends and family, and revel in the compliments (because hey, you deserve them). And when you do, don’t forget to snap a photo and tag #hostthetoast on Instagram. Make me remember that ol’ slumbering sweet tooth of mine! In the bowl of a food processor, combine 2 cups of the all-purpose flour, all of the granulated sugar, the yeast, and the kosher salt. Pulse to combine. In a microwave-safe bowl, combine 6 tablespoons of butter, 1/2 cup water, and 1/2 cup buttermilk. Microwave in 15 second intervals until warm to the touch but not hot– 120-125°F. Pour the warm buttermilk mixture into the food processor along with the eggs. Pulse until no dry flour remains. Slowly add in additional flour, a bit at a time, and process until the dough is soft and supple, and bounces back slightly when pressed with two fingers. Place the dough on a flat, lightly floured surface and cover with a dish towel for 10 minutes. Meanwhile, prepare the filling. In a medium-sized bowl, mix together the raspberry preserves and the fresh raspberries, trying not to break the raspberries apart. Set aside. Grease the bottom and sides of a 9×13″ baking dish. Set aside. Using a rolling pin, roll the dough out into a large rectangle, about 10×18″. Microwave the remaining 2 tablespoons of butter in a microwave-safe dish until melted and brush the melted butter on the dough, leaving a 1″ border around the edges of the dough. Spread the raspberry mixture over the buttered dough (still leaving a border) and roll the dough inward from one of the long sides, creating a spiral with the filling inside. Pinch the edges to seal. Divide the dough into 12 rolls and arrange them in the prepared baking pan. Cover tightly with foil and refrigerate for 8 to 12 hours. In the morning, remove the rolls from the refrigerator and let them come to room temperature– this should take about 1 1/2 to 2 hours. Preheat the oven to 350°F. Remove the foil and bake for 30 minutes, or until cooked through and golden. While the rolls cool, make the glaze. In the bowl of a food processor, combine the cream cheese and lemon juice and process until smooth. A bit at a time, add in the powdered sugar and run the food processor until the mixture is thick and creamy. Thin with up to 2 tablespoons of milk, if necessary. Pour the glaze over the warm rolls and sprinkle with lemon zest. Serve warm. This post has been compensated by Bob’s Red Mill. 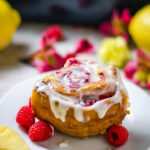 I’ve been getting more in to sweet rolls recently and these look like a great version to try. So pretty and great flavors! 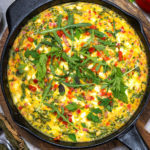 Question: This recipe looks so delicious but I eat Paleo so wud like to experiment substituting a combo of almond flour, coconut flour, flax meal and possibly a little psyllium husk which I have used before. Problem is that I’ve never worked w yeast. Has anyone else made a Paleo yeast bread with any one or combination of these ingredients?